The average weather pattern of the certain area experienced over a long time is called climate. The climate is positive towards human, animals, plants and physical structure. If there is an imbalance in the climate then we can say that there is climate change. Climate change is the change in the statistical distribution of the system of weather when that change lasts for a long time period. For example: - if the monsoon rain occurring in Asar does not occur till Jestha or Shrawan, if the climate is hot till Mangsir or cold till Baishak, etc. are climate change. The main reason for the climate change is the increase in the amount of carbon dioxide in the atmosphere. This gas increases the greenhouse effect in the earth. This increases the temperature of the earth and thus, brings imbalance in the climate. We, ourselves, are the main reason for the climate change. So, we should bring effective ideas for its solutions. In 1830 AD, there were only 281 PPM (parts per million) atoms of carbon dioxide per ten lakhs atoms of air. In 2010, the amount increased and reached 390 PPM. The temperature of the earth increased up to 0.740C in comparison to the temperature of 1901 AD. If the temperature increased in the same way then, it is predicted that the temperature of Nepal would increase by 1.40C in 2030 and by 3 to 6.3 degree in 2090 AD. In coming few years, the snow of our mountain would melt and only the rocks would remain. The settlement in coastal areas would sink. So, we should decrease the production amount of the gases that increases the temperature. The average weather pattern of the certain area experienced over a long time is called climate. Climate change is the change in the statistical distribution of the system of weather when that change lasts for a long time period. 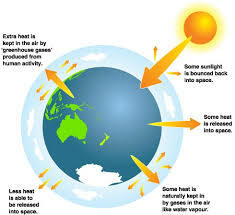 The main reason for the climate change is the increase in the amount of carbon dioxide in the atmosphere. How is climate change connected with global warming? Climate change is connected with global warming as global warming causes climates to change. Even though, a warming trend is global, different areas around the world experience different specific changes in their climates, which have impacts on their local plants, animals and people. How can atmosphere be compared with the walls of the greenhouse? The atmosphere can be compared to the walls of the greenhouse as the walls of a greenhouse, the atmosphere lets in the solar light and absorbs the outgoing heat and keeps the atmosphere heated. What are the major effects of climate change? Extinction of animals and species. What are the effects of climate change already felt in Nepal? The effects of climate change already felt in Nepal are drought, forest fires and flooding. In Nepal, changes in monsoon pattern have greatly exacerbated the situation of the unacceptable presence of poverty and inequalities of opportunities in the county. What do you think should be done urgently to control climate change? How can you contribute to the control of climate change? What is meant by climate change? How is it changed? Explain in detail. The atmosphere of the earth is made up of gas like nitrogen, oxygen, carbon dioxide, etc. Among them, some gases have more heat observing and storing capacity while others have less capacity. So, the change in the amount of results the change in temperature of the atmosphere. Static reveal that carbon dioxide, carbon monoxide, nitrogen oxide, methane gases are increasing in the atmosphere. These gases obstruct the way of the returning of the heat to the space. They absorb the heat or return it to earth, which causes the received heat to be more in amount than the returned heat i.e. radioactive rays. From this temperature of the atmosphere of the earth is increasing. So, the gases that effect in exchange of rays and causes climate change. Explain the factors that influence the climate change. Earth-sun geometry: The earth revolves around the sun in its own orbit. The orbit of the earth is not totally round. It is elliptical. Due to this reason, it is hot when the sun is near the earth and vice-versa. Hence, it influences the climate change. Solar output: Sun is the major source of heat and light in the earth. All the other sources of heat and light are derived from the sun as a secondary source. Therefore, the climate of the earth depend upon the radiation of the sun or the solar output. Atmosphere/ocean heat exchange: due to the heat of the sun, atmosphere/ocean get heated, it changed into vapor and move from one place to another with atmospheric pressure. This water vapor drops down as rain and other forms of water at a suitable condition. In this way, atmosphere/ocean heated exchange influence the change in the climate. Volcanic emission: The volcano is an explosion of molten masses and gases from the core of the earth. This molten masses and gases also influence the change in the climate. Continent drift: Slow movement of the continent toward and away from each other during the history of the earth also helps to change the climate of the earth. The greenhouse effect involves warming of the earth's surface and the ______. One fifth of the air in the atmosphere is covered by ______. It is estimated that ______ CO2 is released each year through fossil fuel.